The shape of this purse is the biggest selling point. It adds a wonderful dose of structure, and the firm quality of the smooth leather is a great contrast. I particularly enjoy the cute but subtle studding on the panels. 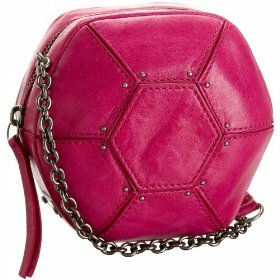 Of course, bright in-your-face fuchsia isn't going to suit everyone, and it is shame that you can't buy this unusual handbag in any other colours. In addition, I am not particularly a fan of the bright and somewhat garish silver chain handle. With the main body of this angular purse already so bright, a subtler metal shade would have made it look more luxurious. All in all this is a pricey and unique evening bag that will get plenty of looks, but may be just a little too obvious for some.